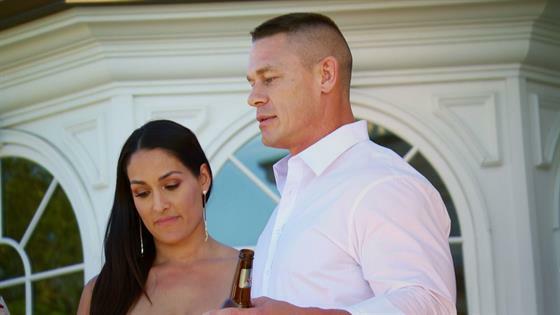 Nikki Bella and John Cena are celebrating their engagement this week on Total Bellas, however, as it turns out, that's not the only reason to celebrate. "Thank you all for being here today to celebrate our commitment to moving forward and getting married," John opens a touching toast. "Step one is asking the question. Step two is the lady saying yes. So those two things are crossed off the list. Now we just have to figure out where we're going to do this. We've batted around some ideas, but we love the state of California and we love wine. We would love to get married in Napa Valley, so that's what we're going to do." The excitement is short-lived, because Brie Bella has a surprise announcement for everyone. "So when you have a little too much champagne, you can't keep any secrets," Brie joked. "I feel here at the engagement party we have all of our family here. I feel like there is so much love around us that I know it's the perfect time to announce the good news." John and Nikki are kind enough to step aside and let her reveal the good news to the family. "Lauren and JJ have a big announcement," Brie shares before making room for her brother and his wife to come reveal their major news. "Well, we really wanted this to just be about Nicole and John today," Lauren Garcia shares before revealing the big news. "We're pregnant with baby number two!" Unfortunately this was not the most exciting news for Nikki on her big day. "Woah. Another person around me is having a baby. I'm done. Like, I don't know," she shares. Ladies and gentleman, Nikki has left the building. See the shocking surprise in the clip above!